“Eat’N’Drink” is arguably the best chai kadai / tea shop in the world. They’ve got over thirty items on a menu that covers some great variations on Chai, Coffee, Sandwiches, Bunwiches, Samosas, Vadas, Bondas and … a Kerala Banana Fry that’s a complete meal in five inches. While regular chai is Rs 3 a cup, Ginger, Lemon and Special Chai are Rs 5 for a small cup and 10 for a larger cup. Black, Ginger and Mint Coffee come at the same kind of pricing. A “Bun Omlet” as they spell it, is Rs 10; a “Double Bun Omlet” is Rs 15. A Vegetable or Egg Sandwich is Rs 15. A cup of Maggi Noodles is Rs15. Vadas and Bondas are Rs 5 each; Egg / Veg puffs are Rs 7 each. Check out the Vermicelli Sweet Milk (also 15) if you want something that tastes like Kheer. * Open from 5.30 am to around 11 pm. This is a stand-by-the-counter-and-drink-your-chai kind of place. The interiors could be a wee bit smoggy, if you’re the fussy type. My advice : forget the fuss and enjoy your Chai and Kerala Banana Fries. Lalbagh is housing mango and jackfruit festival till 15th June 09, number of varieties of mangos and even jackfruits( I never knew there exist varieties in jackfruits until I visited) the famous glass house..
South Indian restaurants in Bangalore can be amusing to the onlooker who actually takes the time to notices these signs. For most of us they’re blind spots. “Kindly pay cash to cashier only.” Who else would you pay cash to? Typically, most South Indian restaurants – the smaller ones – have a cash counter at the entrance. So you decide what you want to order and pay up in advance. What the restaurant owner doesn’t want you to do is pay the chap at the food counter by mistake. That’s when you might get what you want, but the owner doesn’t get the money. There’s possibly good reason why that sign’s out there. I have seen teenagers take a good 10 minutes getting their locks in place, while other people are patiently waiting to wash their hands, after a good masala dosa. But how do you know where the wash basin is, if you’re new to the restaurant? Just look for the sign that says “HAND WASH” with an arrow pointing you in the right direction. The annual mango party is back at Ranga Shankara and will be held on Saturday May 23rd from 2 PM to 6 PM. 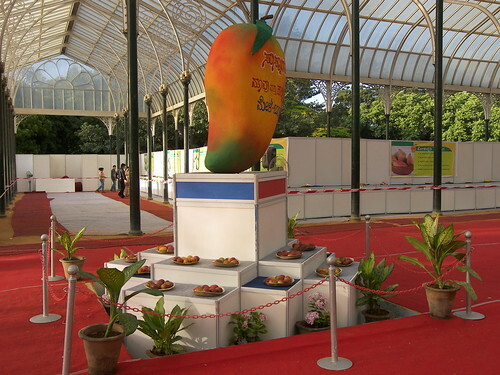 A one of its kind event in the country dedicated to the Mango, one of India’s special gifts, Mango Party is all about celebrating the mango every year in so much abundance and variety. 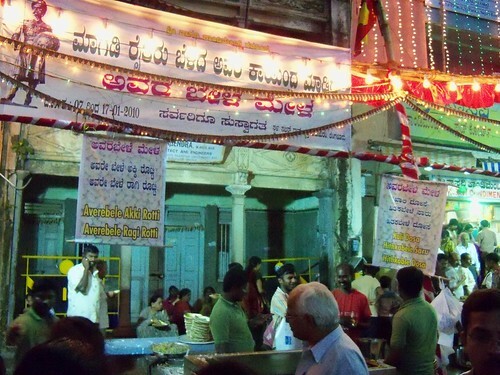 Keeping in tune with the Indian tradition wherein the mango is seen as a community fruit, Ranga Shankara has celebrated the Mango Party annually with great zeal involving large numbers of people. With the theatre community being in attendance one can look forward to spontaneous songs, scenes and entertainment. This year there will also be special entertainment for children and others in the form of mango stories by Padmavati Rao, mango games, Paint-a-mango, on-the-spot story writing contests, best mango recipe (send your recipe to rstheatre@gmail.com to enter the competition) and much more. The party is open to all. All one needs to do to enjoy the party is bring a kilo of mangoes and eat as much as one can from the pool. Ranga Shankara will strive to bring as many varieties as possible to the pool. 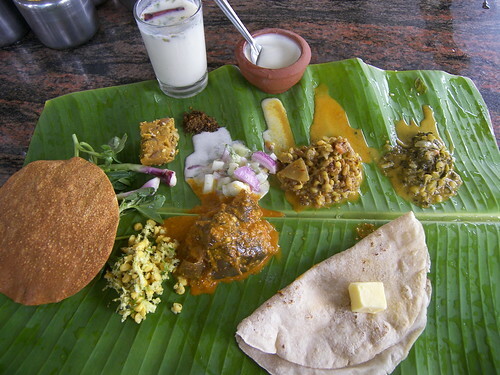 Served on a banana leaf the north kanara meals are a pleasure to enjoy. This meal is popular for soft and tasty Jowar (Sorghum) roti served with a brinjal curry, cucumber and onion raita (salad) in Curd, greens & lentils curry. A few days ago, we took one of our binge breaks during lunch for an unlimited thali. And the name on top of our list was the restaurant at Brindavan Hotel. Easily among the best places for a vegetarian thali if you can manage a “post meal snooze” that is inevitable. The taste here is truly typical of a “Bangalore/Mysore” thali, if there’s one. You start your “session” with a banana leaf that has at least four vegetable “kootus” and “poriyals”, along with soft, fluffy chappatis (you can eat as many as you want.) You then have the sambar, rasam and curd sessions with rice – again unlimited. Another highlight here is this chap who keeps floating around with a tray of appalams – catch his eye and he’ll hand out an appalam and a smile.